Looking for Korg SP170s Digital keyboard? Find out about Korg SP170s Review. In this page we are going to look at Korg SP170s Specs, features and find out makes it tick. This keyboard form Korg focuses only on the most important features you need in a piano like key action and realistic sound. 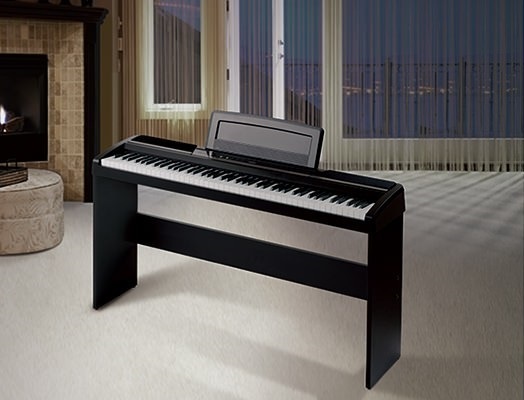 The SP-170 piano is designed in such a way that it is easy to use. Its simplicity has made it to be more popular among pianists. Its popularity came as a result of its focus on the pianistic essentials of sound and playing touch. The volume and power switch have been placed in a place that enables the user to operate the digital keyboard with ease. The sound and piano play button have also been added. The New Natural Weighted Hammer Action keyboard is precisely weighted to reproduce an acoustic piano touch and feel. It also comes with 3 levels of Key Touch Control. This enables the keyboard response to be matched to nearly any playing style. SP-170S features a duo of concert grand piano sounds. Each sound has been lavishly recorded with meticulous care. The many velocity layers are used to capture nuances of playing dynamics which allows the instrument to respond expressively to every delicate touch. Other sounds such as harpsichord electric piano and organ have also been provided. It comes with selected Reverb and Chorus effects which add an extra dimension to the SP-170S’s sound. The SP170S comes with new enhanced speaker system. It has 2 oval speakers that generate enough sound that will amaze you. The design is also done in such a way that it improves the resonance and tone, giving you a more powerful sound.